Rep. Judy Chu (D-El Monte) said she would begin legal action Nov. 2 against Republican Assembly candidate Matthew Lin after he rejected a call made by the congresswoman and other California Democratic leaders to stop implying their endorsements in his campaign literature and other material. 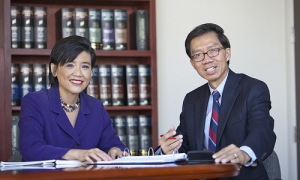 Rep. Judy Chu with Assembly candidate Ed Chau. Chu, who has endorsed Democratic candidate Ed Chau in the 49th Assembly District race, said she would meet with her attorneys to take steps to legally stop the Republican from using photos, quotations, and their names in his campaign materials. Chu said her efforts are supported by other Democrats who are also outraged by Lin’s use of their photos and names, including Rep. Adam Schiff (D-Pasadena), State Controller John Chiang, Assemblymember Mike Eng, Los Angeles Mayor Antonio Villaraigosa, and U.S. Secretary of Labor Hilda Solis, a former member of Congress. Chau or Lin will replace Eng, who is termed out and has endorsed Chau as his successor. Chu, who is Eng’s wife, also represented San Gabriel Valley in the Assembly. This is not the first time a local legislative race has been between two Asian Americans. In the 2009 special election for the 32nd Congressional District, Democrat Judy Chu defeated Republican Betty Chu. On Nov. 1, Chu sent a “cease and desist” letter to Lin, asking that he voluntarily stop using the materials and apologize for their use. He rejected that request, Chu said. “It’s unfortunate that Republican Matthew Lin continues to try to deceive voters in a desperate attempt to appear to be bipartisan despite his right-wing agenda,” said Chu. “Lin is a partisan Republican, which he is clearly trying to hide with this illegal use of the names and photos of Democratic officials in his materials. One of Lin’s mailers contains a photo of Chu and Lin together and some complimentary remarks Chu has made about Lin, but has a disclaimer in small print saying that no endorsement is implied. Lin’s actual endorsers include Reps. David Drier and Ed Royce, State Board of Equalization member Michelle Steel, State Sen. Bob Huff, Assemblymember Curt Hagman, Los Angeles County Supervisors Mike Antonovich and Don Knabe, Monterey Park Mayor Mitchell Ing, Rosemead Mayor Sandra Armenta, and San Marino Mayor Richard Sun. Lin’s campaign has also taken legal action against Chau. According to The San Gabriel Valley Tribune, Lin’s wife, Joy, has sued Chau’s campaign for displaying her Social Security number in one of its mailers. 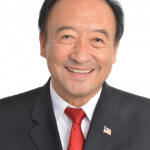 A judge has issued a temporary restraining order requiring Chau’s campaign to pull the flier and a YouTube video in which the flier can be seen. Ed Chau you exposed Dr. Lin’s wife social security number. You’re a trial lawyer and now you and your friend and pushing frivolous lawsuits. Shame on you.